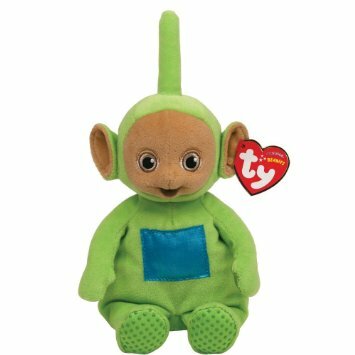 Dipsy is made from a lime green material with a tan coloured face and ears. He has embroidered eyes and an embroidered brown mouth. He has a shiny blue square patch on his belly. On the bottom of his feet are small green spots. Dipsy was released in 2010. He is based on the character from the children’s television series, Teletubbies. He is one of four Teletubbies characters released. The other three are Laa-Laa, Tinky Winky and Po.